At its meeting on 5 July the Forum heard from the architects Bennetts Associates about the plans for the Sports Hall. The architects wanted to make a bold civic statement but could not be grandiloquent, because the railway tunnels ran just beneath the site. They also wanted to pick up motifs from the (rather distant) railway sheds. 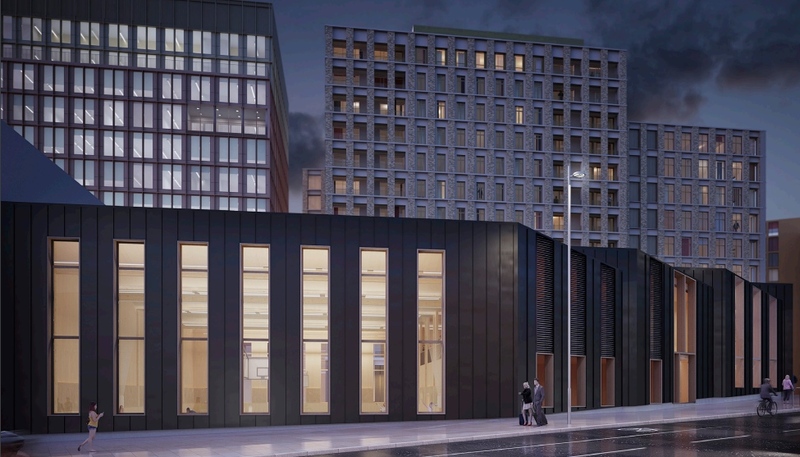 Regardless of its boldness, the proposed building will be overshadowed by the blocks to the west of York Way, which can be allowed deeper foundations. Members of the Forum were also concerned that it was ugly and dark; even if it was a civic statement it was perhaps not very civil. The same concern had been expressed at the meeting of the Design Panel and Access Forum. The planning application submitted thereafter (2016/5580/P) appeared to ignore this concern, which the Forum then reiterated in a short response. Also at the meeting the landscape architect Julia Finlayson from Argent outlined the intentions for the public spaces around the site. The outline was valued highly and prompted requests for a further treatment, covering the whole area, at greater length. The minutes of the meeting provide a summary of all this. This entry was posted in Central developments, Sports Hall. Bookmark the permalink.